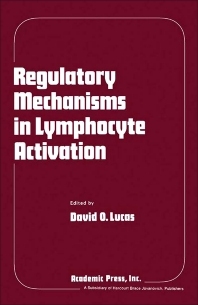 Regulatory Mechanisms in Lymphocyte Activation covers the proceedings of the 11th Leukocyte Culture Conference, held at the Arizona Medical Center, University of Arizona on September 19-23, 1976. The contributors cover the various aspects of the conference theme ""Regulatory Mechanisms in Lymphocyte Activation."" This book is organized into 15 parts encompassing 160 chapters. The three symposium parts discuss the parameters of lymphocyte activation, positive regulation, and suppression. Considerable sections explore the membrane determinants and receptors; major histocompatibility complex; lymphocyte response; and kinetics of DNA synthesis and cell proliferation in lymphocyte activation. Other general topics covered include subpopulations of immune reactive cells, leukocyte separation techniques, cell interactions, and ontogeny of lymphocytes. The remaining parts consider the leukocyte regulatory mechanisms and issues in lymphocytotoxicity. Immunologists and cell biologists will find this book invaluable. A Single Second Signal for Mitogenesis? Is There Gene Amplification or Other Nonduplicative DNA Synthesis in Human Lymphocyte Activation? Is There a Relationship between Effector-Target Cell Binding and Cell-Mediated Cytotoxicity? Kinetics of the Potentiation of DNA Synthesis by "Lymphocyte Activating Factor"